A young school teacher from a remote village in Manipur has created history by writing a novel using his smartphone. 28-year-old M Paominlal Haokip, popularly known as M Lalcha Haokip released the novel titled Henu Kanao Akap’e(Mother, my brother is crying for you) on his 28thbirth day. 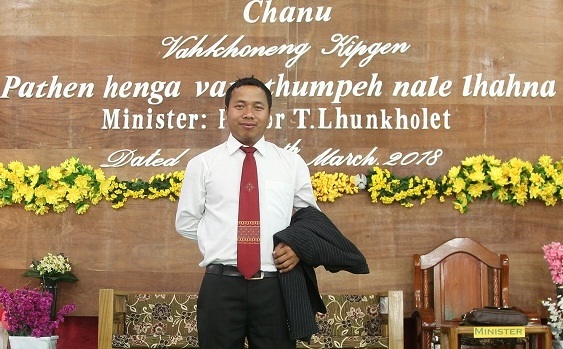 The novel was formally released by Pastor Mangjapao Haokip of Kuki Baptist Convention at Pallel town, 50 km south of Imphal under Tengnoupal district on April 18. There’s a saying best mood and thoughts in life often come unannounced and people want to note them down somewhere more than just in your memory. “The inspirational comments and responses from Facebook or WhatsApp users on his write-ups on roles of youths/students, their responsibilities and spiritual life etc are the driving force for me to think and write more on phone,” Lalcha, social science teacher at Corner Stone Academy, told reporters. “I write or note down anything that comes to my mind on my mobile whenever I go to any place. That’s the advantage of having or carrying a smartphone,” he added. So far Lancha, fourth son M Doukholun Haokip and Ngaitin Haokip of Sita village, 84 km south east of Imphal under Tengnooupal district bordering Myanmar, has written more than 500 poems, short or long stories and proverbs since he owns first ever smartphone in October, 2015. He took 29 months to complete his 72-page novel in Thadou-Kuki dialect. Lalcha’s novel comprises 36 chapters which he typed on his phone. Cautioning the social media users to be careful enough while sharing or uploading provocative materials, Lalcha the fifth among a sibling of seven, appealed Facebook and WhatsApp user to use the new media for a positive change.